Tony Stark a.k.a. Iron Man is back. In this second adventure, the now outed super hero faces new pressures from the United States Senate along with the Military to give up his weapon's designs. Stark is also opposed by a rival Industrialist who is very eager to steal the very same designs. All of Stark's new responsibilities become widely scrutinized after a Russian scientist invents and uses the same technology created by Stark for ill will. Iron Man must then confront his oppressors while forging new alliances that will ultimately aid his cause. Super hero sequels can be widely scrutinized. They generally have a lot to live up to. Where the first film has the ability to spend a good portion of time setting up the character/hero, the sequel is left with far more time to play around with character development and/or villain(s). "Iron Man 2" definitely spends quite a bit of time developing Tony Stark's super hero persona. The 125 minute adventure also develops familiar faces like Pepper Potts and Lt. Col. James Rhodes along with newly introduced foes and alliances. "Iron Man 2" also does a balanced job of further building up to the Avengers team-up we know is coming. Marvel studios had put both script writer Justin Theroux and director Jon Favreau in a odd predicament with "Iron Man 2." They were assigned the task of developing the Iron Man character while also laying groundwork for "The Avengers" movie which is due out in 2012. Favreau and Theroux both do a noteworthy job of mixing the two. Sure there are moments where the film feels slightly bogged down by all the development, but how can any Marvel fan not be jazzed by all the mouth watering elaboration? Hearing a few negative reactions to the amount of non-action in the super hero sequel. My initial response was, did you not see the first film? Both Iron Man and its sequel are a strong mix of drama, comedy and action. Neither of them are overloaded with either and seem like a harmonious blend of the three. 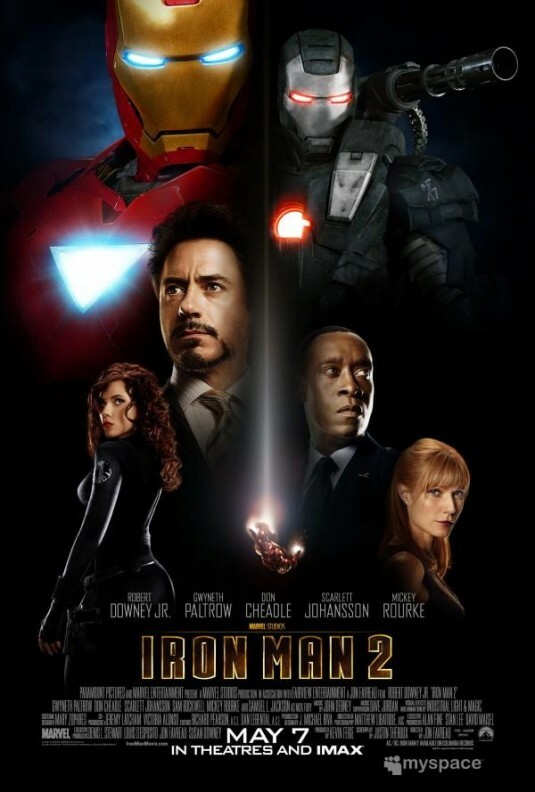 Quite honestly, "Iron Man 2" follows very closely to the pacing of the original film. I noticed this on my seconded viewing of the sequel having watched the 2008 film beforehand. The action throughout "Iron Man 2" is well put together and all around eye-popping, however each sequence does seem slightly brief. That said, there is a very good reason the sequences feel brief. The Iron Man, War Machine and Whiplash suits are extremely destructive weaponry. There is only so many rockets, lasers or electricity bursts they can take before the suits are completely destroyed. So the battles that ensue can and do feel relatively short. Does that mean they are ineffective? No way! The action sequences are thrilling and cheer inducing all the way through. Especially the finale, which has far more going on, not to mention leaps and bounds better than the climax of 2008's Iron Man. Quite a bit of credit must be given to the entire visual effects departments at ILM or any of the other companies utilized. Absolutely fabulous stuff. All of Stark's tech looked immaculate once again, especially all of the digital layouts he would render within his workshop. I did miss seeing more of Stark's POV underneath he mask. We got lots of shots of his face behind the mask, but very few POV shots, that were used in the first film. I was also very enthused that Marvel studios decided not to throw "Iron Man 2" under the 3D band wagon. Instead giving us a stimulating experience without the use of the now trendy gimmick. The cast of "Iron Man 2" is immaculate. I do not have a negative thing to say about the lot of them. The returning cast members are spot on and the new faces really impressed me with their screen time. I would've liked a bit more of Mickey Rourke as Ivan Vanko, but the trade off was a show stealing performance by Sam Rockwell as Justin Hammer. Rockwell as Hammer was a perfect antithesis to Tony Stark. Scarlett Johansson also really impressed me in her portrayal of Black Widow. A performance that I went into the theater with very low expectations, she did an excellent job and I look forward to seeing more development of her character in the near future. The last performance that I should touch on briefly is Don Cheadle. Cheadle of course replaced Terrence Howard as Lt. Col. James Rhodes and I could not be happier with the end result. Cheadle does a solid job both as Rhodey and later as War Machine. In the end, "Iron Man 2" is exactly the sequel I hoped for. The movie does not stretch itself too thin with multiple story arcs, however it has enough that we are shown new developments on a number of levels. The sequel does a bang-up job of further build-up to The Avengers, while also wetting our appetites for further Iron Man stories. Marvel fans are sure to get a kick out of all the easter eggs throughout, not to mention a insanely cool set up for another Marvel super hero after the credits. As always sir, excelent review. A great read!